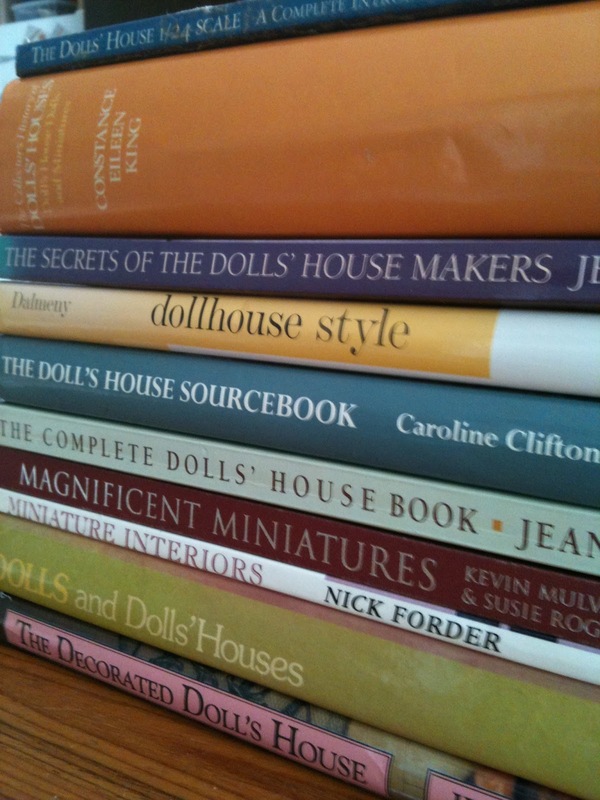 I have amassed quite a collection of dollhouse reference books. All of these were bought online, so without browsing beforehand I took a chance when I bought them. Some are great, others have been a bit disappointing. So I thought I would do a quick review of some of my better books. I have based my review from the point of view of the non-professional but proficient and discerning miniaturist, with an interest in the history of dollhouses, techniques of the craft and the work of well known miniature artists. This book offers the most comprehensive and fully researched account of the history of dollhouses (up to the 1980s) I have come across . The author begins with the very first historical records of dolls and dollhouses in the ancient world and discusses their specific cultural meaning in different societies. She then traces the emergence of dollhouses in post Renaissance Europe and their meaning in modern day. This book is written in the style of a proper academic history. It is an excellent (if not the best) reference for the antique dollhouse collector, but also give a good background to the 1:12 hobby of today as well. It is easy to read, and can be picked up at any one topic area without the need to read the entire book. I think this tome is a must have in any dollhouse reference library. The only down side to the book is that the majority of images are in black and white. Constance Eileen King wrote many other historical reference books concerning dolls and toys. This is another excellent academic level book concerning the history of dolls and dollhouses. This book is a less comprehensive version of The Collector's History of Dollhouses by the same author, and devotes more time to dolls. The book is quite comprehensive and is very easy to read. There are a few more colour photographs in this book due to its smaller size. While it is not as comprehensive as the Author's 1983 work, I would recommend it none the less as an excellent reference book. This book is an excellent reference book which provides profiles of miniaturists of note. Each profile discusses how each artist was introduced to the field, the types of work they have done and their individual philosophies on their hobby. The profiles also give some nice anecdotes about individual projects that have been important in the artists' careers. The book is full of excellent photographs of many pieces of beautifully handmade furniture, houses and accessories. Each picture is accompanied by an explanation of its history, maker and occassionally a back story. I found this a great reference for the "big names" of the miniature world, and helped me to understand the different approaches that different miniaturists take to the building and promotion of their work. This book is very comprehensive, professionally written and a great source of inspiration and fascination. This book is combination of a reference book for miniature interiors representing different historical periods, and a "replicate that historical style " do-it-your-self instructional book. The book contains pictures of individual rooms from 15 different historical periods. Accompanying each period is a fact sheet on how to construct one or two pieces of furniture or accessories from the room. I didn't find this book to be terribly valuable for a reference book because while the pictures were big and beautiful, it did not give much information about how and who created the individual rooms, and when they were created. Instead the bulk of the information attaching to each was a basic and vague description of the historical period and how the particular rooms were used. This meant it was not comprehensive enough to be useful as a either a social history or a history of the dollhouse maker. Further, the book does not differentiate between modern dollhouses made to emulate a certain period, and historical dollhouses which were actually made during that period. The projects described are quite basic and a little crude. Each project purports to recreate a miniature from a room, however, with the instructions and materials detailed, only a very coarse version of what is pictured can be made (without any significant creative license used by the maker). In this respect I found this book quite disappointing. I would only recommend this book for beginners and not or the more advanced miniaturist or anyone looking for a reference book. This book begins with a brief history of dollhouses in Europe, beginning with the standard description of Dutch "baby houses" and finishing with a mention of the modern dollhouse hobby. The book is then divided into chapters according to room, i.e. dining room, bed room, and hall. Each chapter contains many lovely pictures of miniature interiors. I found this book disappointing because after the history of dollhouses at the beginning, nothing more is mentioned about dollhouses. The text which accompanies each chapter gives only a brief social history of the use of that particular room over the past few hundred years of (full size human) history. It almost feels as though the dollhouse component of the book was created as an after thought to fit around a preprepared essay written about social history of the developments in the use of different rooms over the past few hundred years. Further to this, only a few of the makers of the miniature interiors (some of which are quite fabulous) are referenced. The reader is left to wonder at most pictures, if its contents were hand made by a miniaturist or where store bought and assembled, and if so by who and in what country. I would recommend this book as a good reference for someone who is planning a dollhouse and isn't quite sure how it should be laid out or the furniture placed with regard to any particular period. The pictures are lovely, however the lack of attribution is very annoying. This book is an excellent and well rounded account of the modern dollhouse and miniature hobby. It describes everything from how to choose the perfect dollhouse style for you, how to create authentic interiors from different periods, to practical information about construction and choice of lighting, interior decoration and furnishings. It gives a large variety of photographs of dollhouses from all periods and construction types as well as step by step pictures of houses in the process of being built. The book also gives some great information about kit houses available as well as information about miniature artists. It is well written and easy to read and also comprehensive. If you are researching the hobby, looking for inspiration on what type of project to take on next or want tips and tricks this is a great all-round book. It really is the complete dollhouse book, and I would recommend it as a must have. The author Jean Nisbett has written many books about the dollhouse hobby, and is clearly very passionate about it. Going on what I have read by her (only the two books in this review), I would recommend anything she has written! This book is a complete account of the career and works of Kevin Mulvany and Susie Rogers, of the "Mulvany & Rodgers". This is an excellent source book of ideas for miniature interiors of the very highest quality. Mulvany & Rodgers create historically accurate copies of famous houses and buildings to commission and their work is displayed in museums all over the world. The book is a pleasure to read, and contains many amusing and interesting anecdotes from their careers, including projects that failed and why. It also contains several "how to" pages with projects explanations of different techniques. This are well described and easy to follow and understand - allowing you to produce some very pleasing results at home. This is a must have book for any aspiring miniaturist. This book is a brief description of several 12 different miniature rooms in a range of styles. The book gives several excellent photographs of each room from several angles accompanied by a very brief description of the style that the room is emulating. The description covers the full size history of that style. The book contains some interesting styles not seen in other books, such as the "Sante Fe Store", the "Egyptian bedroom" and the "New York Apartment". Beyond this though, the book is not terribly comprehensive and does not give much information on construction techniques or the artists behind the creations. This is a beginners guide to creating several different styles of miniatures room. The author gives detailed instructions on how to create many different pieces of furniture, accessories and soft furnishings according to different period styles. The book is aimed at the decorator of a kit built or pre-fabricated bought dollhouse. The projects are quite simple, and aimed at the less discerning miniaturist, the beginner or child. Some tips and tricks are useful and creative, but the over all attention to detail is not high and scale is not terribly precise. Please let me know if you have read any of these books and agree or disagree with my reviews. I would be interested to know what you think! Thank you so much for th review. I have several of those and must say I agree with you completely. It's amazing how easy miniature projects can be when you know how. Thanks Giac, I'm glad you agreed. I think I will have to purchase some more books by Jean Nisbett, they are very well written! Thanks for the references. I often consider buying books on miniature on line but because I can't flick through I am reluctant so your reviews are very helpful. You recently asked me how I did my Kitchen tiles.My apologies for not responding sooner. I'm not sure if you are a follower of Josje's blog a 'beautiful world'? If not may I suggest you have a look. She has a web site with a tour of her Cannel House and in the tour of the kitchen she explains how she did her tiles. I will leave you the link to her website and I will make up a quick post on how I did the tiles and the mistakes I made. That way I wont take up to much room on your blog. Thanks a lot for going to the trouble for me! I do follow Josje's blog - it is wonderful, and I have explored all her little rooms with great interest. I didn't see her tiling post though, so thanks for pointing it out. I will read it all with interest, and am looking forward to my new project (a bathroom). Hello Emily! I visited Fi's blog and saw the link to yours, so here I am: your newest follower :D!! About these books: I don't have any book from the list. I make miniatures by studying the objects in real life and give it a try to make them. So I am afraid I can't help you with the list of books, I am sorry ;)! Hi IIona, welcome! Thanks for checking out my blog. I am now your newest follower too. I very much enjoy your posts, you have made some wonderful things. I hope you can check out some of the books I have reviewed here. Some are wonderful, and give some good inspiration for future projects. Looking forward to reading some more of your posts! Hi Fi, I have loads of books, like you, but only 2 of these: Magnificent Miniatures by Mulvany and Rogers, a truly wonderful book and The Dolls House Sourcebook, useful when I first started building my house, but I never look in it now. So I totally agree with your awarded stars. I think that you also need books on RL period furniture and architecture if you want it to look realistic in miniature. I'll write a post on those, in the same way you did and I'll refer to your post. Oh I'm glad you agree with my reviews! I was hoping people would find them accurate. It would be great if you wrote some more reviews. I a always on the lookout for more books, and tips on which books are good is excellent.